The Conference Committee has assembled a Program we feel will appeal to a broad spectrum of individuals concerned with water resources. The call for abstracts has produced a variety of interesting and relevant topics including: water for energy, water resources availability and management, and climate conditions. Keynote addresses by: Takashi Asano (world-renowned authority in water recycling and reuse), Jennifer Orme-Zavaleta (Interim National Program Director for Safe and Sustainable Water Resources Program, EPA), and Gary Gill (Deputy Director for the Environment, Hawaii Department of Health). 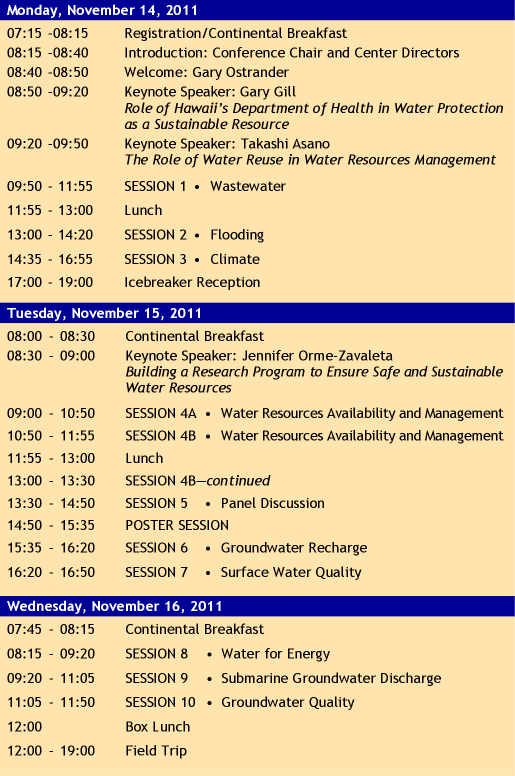 Technical program with over 50 oral presentations, 2 panel discussions, and a poster session. An international selection of presenters from Australia, France, India, Spain, Taiwan, Trinidad, and more. Speakers from the Trust Territories will also be presenting along with those from the United States. 30 inches wide x 42 inches high. Please make the size adjustments accordingly. Make your reservations early (at no additional cost) for a unique opportunity to visit Kamehameha Schools' North Shore Plan, a sustainable vision of the future. Plans to revitalize commercial properties and address the agricultural, educational, residential, sustainability and alternative energy issues have already started within the 26,200 acres property. 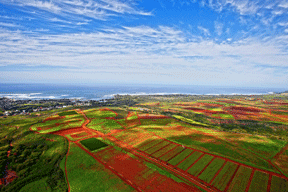 The 45 minute tour, co-sponsored by Kamehameha Schools (KS), will take place in the North Shore area on the island of Oahu. The excursion will cover the plantation area with a visit to the fishpond where additional information will be provided and refreshments will be served. Seating is limited on a first-come first-serve basis. Please make your reservations by indicating on your Registration Form that you would like to attend this field trip. Transportation, lunch, and refreshments are included. For more information contact Aly El-Kadi at elkadi@hawaii.edu. A historical fishpond in Haleiwa was once a sustainable and productive pond that produced fish for Hawaiian royalty. Restoration has begun with 5,700 volunteers to restore the site as a functioning fishpond to educate and provide food for the community in the area. • Agricultural activities and the extensive water system renovations and improvements. To learn more about the "North Shore Plan" visit www.ksbe.edu/nsplan. View the video for American Planning Association's 2011 National Planning Excellence Award for Innovation in Sustaining Places www.ksbe.edu/nsplan/media.php. The tour is limited to 48 participants. The last day to reserve a space is October 12. *The first group will check-in at 1:30 pm. Travel time from the Ala Moana Hotel to the site will take about one hour. The tour itself takes 45 minutes. We will be separated into groups due to the limited number of vehicles. The waiting area will have a tent with tables, chairs, refreshments, and exhibits. Free time is allowed before and after the tour, but we will check-in as a group 15 minutes before the tour begins. No restroom stops will be made during the tour, but portable toilets will be available at the waiting area. Please plan on arriving back at the hotel around 6:00 pm or later due to the traffic. Space is limited, so there is no guarantee that everyone will be included.